So many applicant make the mistake of choosing a wrong subject in waec gce registration when they apply online. To help them, we have compiled the list of Approved Subject in WAEC GCE for Private candidates and highlighted those that are compulsory. Note: Art students can also borrow subjects like commerce and Agric Science to complete their subjects. So many applicant make the mistake of choosing a wrong subject in WASSCE for Private Candidates when they apply online. 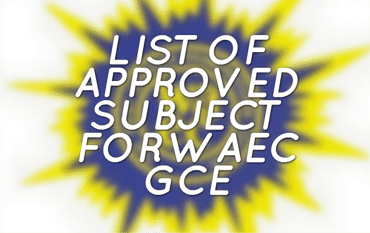 To help them, we have compiled the list of Approved Subject in WAEC GCE for Private candidates and highlighted those that are compulsory.